A Façade Improvement Grant Program funded by Collinsville Downtown, Inc. and FHL Bank, Topeka, Kansas has provided financial assistance to seven downtown merchants for improvements and repairs made to their business façades. Three additional property owners are expected to receive grant monies in January 2010. There is nearly $4,000 in grant dollars available to eligible businesses. stories of the front of buildings/ businesses and includes windows, signage and awnings. Create a beautiful downtown business district that attracts visitors, stimulates business growth and creates jobs. Collinsville Downtown, Inc. Design Committee administers the Façade Grant program and offers design assistance to grantees. The Collinsville Downtown, Inc. Board of Directors approves all grants. Grants are available on a first-come, first-serve basis, and reflect a 50% match of the completed project costs up to $2,000. For example, a project cost of $4,000 could result in an grant award of $2,000. Buildings/Businesses must be located within the Main Street District. (One and one half block north and south of Main St., between 7th & 14th Street). Grants will be awarded on a first-come, first-serve basis and will be limited to one application per business address. Businesses can apply for up to $2,000.00 maximum matching grant. Grant dollars do not apply to any work started before approved start date. Once approved, work must begin within 90 days from the awarding of the grant and must be completed within 6 months. Improvements shall conform to the Secretary of the Interiors Standards for Rehabilitation. For more information contact the Collinsville Downtown Inc office at (918) 371-5530 or e-mail: collinsvillemainst@sbcglobal.net. (email web site questions/comments to wrightted@aol.com). 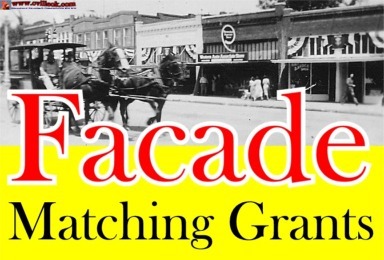 A façade Improvement Grant Program has been established to provide financial assistance for persons within the designated Main Street District enabling them to make improvements or maintenance repairs to exterior facades. For the purpose of this program, the term façade includes upper and lower stories of the front of buildings and businesses. This matching Grant Fund for façade improvements has been implemented to stimulate efforts to preserve the historic integrity and appearance of Collinsville's commercial business facades. This program is funded by Collinsville Downtown Inc. and FHL Bank located in Topeka, Kansas for the purpose of improving the Main Street District's appearance, stimulating business growth and creation of jobs. Collinsville Downtown Inc. will administer the program and offer design assistance. Grants are available on a limited first-come, first-serve basis beginning November 22, 2005 for amounts up to $2,000.00 of the total cost of the improvement project, upon approval by the Collinsville Downtown Inc. Review Board. Each grant must be matched by the applicant dollar for dollar, based on actual paid receipts. · Building/Businesses must be located within the Main Street District. (One and one half blocks north and south of Main St., between 7th and 14th Streets). · Grant will be awarded on a first-come, first-serve basis and will be limited to one application per business address. · Application must be received no later that February 01, 2006. March 2, 2006 note: The application deadline above has been extended but you should contact Collinsville Downtown, Inc as soon as possible. · Businesses can apply for up to $2,000.00 maximum matching grant. · Once approved, work must begin within 90 days from the awarding of the grant and must be completed within 6 months. We sincerely hope that the business and/or property owners of Collinsville take advantage of this wonderful opportunity to improve, enhance and increase the value of their street-front property. Nancy Phelps, Program Director, Collinsville Downtown Inc, @ 371-5530.